In celebration of the 201st anniversary of the nights that inspired the writing of Frankenstein, the PDF Versions of both the Ghastly Affair Player's Manual and Ghastly Affair Presenter's Manual are now 15% Off! 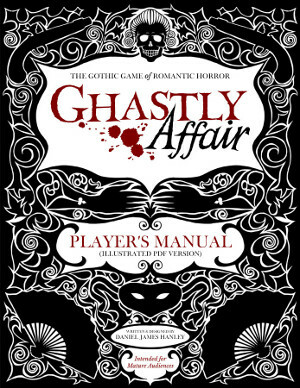 The Ghastly Affair Player's Manual was $12.95. Now $11.00 until 7/3/17! 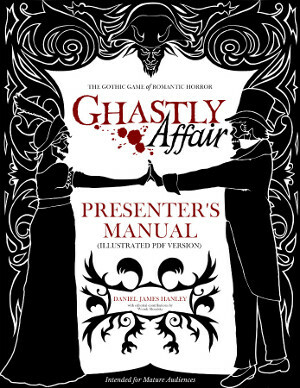 The Ghastly Affair Presenter's Manual was $9.95. Now $8.45 until 7/3/17! Now is the perfect time for you to discover "Ghastly Affair", the "Gothic Game of Romantic Horror". Experience the delirious age of Marie-Antoinette, Napoleon, and Lord Byron. If you ever wanted to waltz with the Devil, pursue forbidden love with a desperate highwayman, or attend High Society parties as perilous as any battlefield, "Ghastly Affair" is the game for you! Be the brave Demon Hunter fighting supernatural evil, the shameless Libertine seducing their way across opulent salons, or the True Innocent shining like a light among the wicked. Experience a world of haunted castles, cursed aristocrats, and shocking scandals. Your character might even uncover the secret of reanimating dead flesh! Note: Because Ghastly Affair is intended for mature gamers, you must be signed in to DriveThruRPG to see the listings.